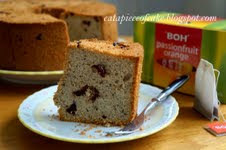 Mich from Piece of Cake kicks off our round-up this month; she got it third time lucky with her Fruit tea cranberry chiffon cake, after two attempts she wasn’t so pleased with, and used a fruit tea to give the cake a lovely flavour. Next we have a double F entry from my Alphabakes co-host Ros’s mum. 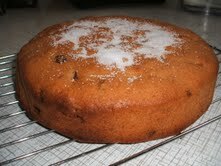 She made a flourless fig cake, which also uses orange and lemon zest. I’ve never had figs in a cake before so I’m intrigued, and think this sounds very nice. She also made a fish pie – I’m personally a big fan of fish pie and I love how the pie is decorated to look like a fish! One of the first bakes that sprang to my mind when I chose the letter F was financiers, though I didn’t actually know what they were! 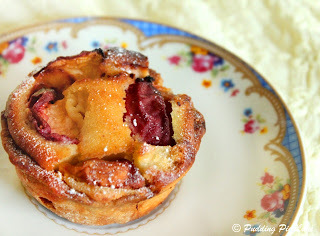 Luckily Jean from Baking in Franglais made some and so I’ve discovered they are little light French cakes, often mistaken for pastries, that are made using ground almonds and only the whites of an egg. 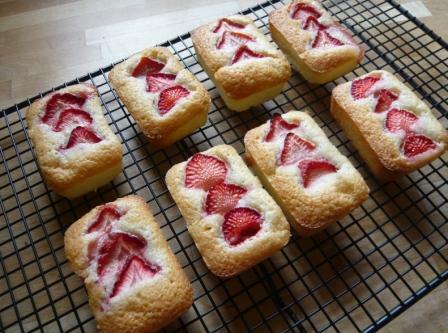 Jean’s strawberry and lemon financiers, with sliced strawberries on top, are perfect for summer. My mum made a traditional fruit cake, which is one of her specialities – I remember her telling me when I was young that fruit cake always tastes better when it’s a day or two old. Does anyone know why that is? I couldn’t resist sharing an old post of something I baked a couple of months ago as I am very proud of it! A fraisier is a strawberry and cream cake, that has two layers of genoise sponge, and is filled with crème patissiere with strawberries standing around the edge of the cake, finished with a layer of marzipan – or in this case pink fondant – on top. See how I made it here. Have you heard of Fat Rascals before? I hadn’t, so thanks to Eira from Cookbooks Galore for educating me! She says they are a cross between a scone and a rock cake and are made in the same way as a Welsh cake, though where the name comes from may be open to interpretation! They look like lovely little goodies. 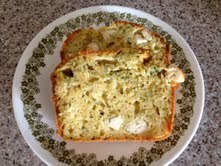 Here we have another entry from Ros’s mum, a feta cheese and herb loaf. I think this would be perfect to take on a picnic! Janice from Farmersgirl Kitchen treated us to these cherry frangipane ramekins, which are adapted from a Nigel Slater recipe. 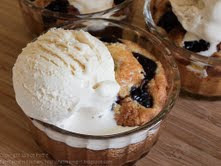 She says they are quick, easy and very satisfying, and especially good served with ice cream. I was hoping someone would think of flapjacks and lo and behold, here we have some from Olivia of Liv a LittleBakery. Her ginger flapjacks only use five ingredients and look lovely and gooey. I’ve wanted to try making Falafel for a while, and had the opportunity when we had a savoury-themed food tasting at my Slimming World group (yes, I bake cakes, and go to Slimming World –I’m sure I’m not the only one!). They were easy to make and would be good to take on a picnic or in your lunchbox for work. This beautiful cake comes from my Alphabakes co-host Ros at The More Than Occasional Baker. 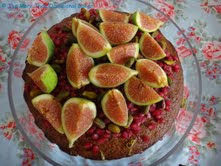 It’s a fig, yogurt and walnut cake, with pomegranate and pistachio – very fruity and I love the way she has decorated it with figs. Victoria from A Kick at the Pantry Door made these falafel, and some homemade tortilla wraps to serve them in. Her serving suggestion also includes red pepper and halloumi – I wish I’d thought of that when I made falafel! I agree with Fiona from Sweet Thing You Make My Heart Sing when she says “with the hot weather I have being wanting less hot meals but more than just a lettuce leaf”. So she made garlic and coriander flatbreads, which take just a couple of minutes to cook so no slaving over a hot stove and go with all manner of summery foods. What a good idea! 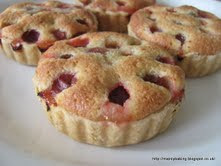 Suelle from Mainly Baking used home-grown gooseberries to make these frangipane tarts – I imagine the sharpness of the berries would be offset by the sweetness of these tarts and they look really cute. 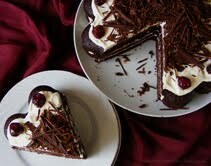 This delicious and decadent Black Forest Cake comes from Elizabeth at Elizabeth’s Kitchen. I love the mould she’s used for the cake as well, which makes each slice look like a heart shape. 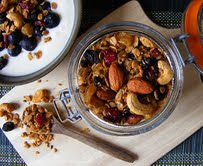 She also made this fruit and nut granola –they do say breakfast is the most important meal of the day! Welcome to Alphabakes first-timer Dawn from A Cup of Tea anda Slice of Cake, who has made Florence’s Orange Cake; the sponge, buttercream and icing all contain orange and the top is decorated with Fruit Flakes – a double F! I’m so pleased that someone had a go at making Fondant Fancies – after seeing them on the Great British Bake Off I realised they are actually very difficult! 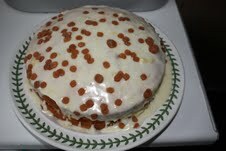 Laura from I’d Much Rather Bake Than.. stepped up to the challenge with great success. 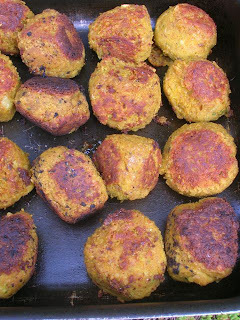 Here are some more falafels, but with a twist – true to her name, Choclette from Chocolate Log Blog has added chocolate to these tasty morsels. They formed part of a six-course chocolate-themed dinner, which sounds amazing! 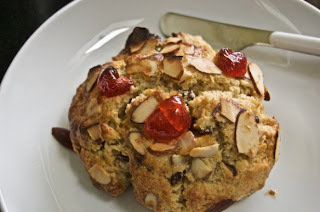 I used a slightly more unusual ingredient for these biscuits – unusual in my kitchen at least. These orange and fennel tuiles didn’t last long! 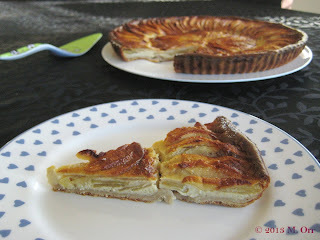 Xinmei of Pudding Pie Lane, who I met recently at a blogger event, has made these delicious peach frangipanes. They look really tasty and I don’t think there’s anything wrong with what Xinmei calls the “rustic” look! 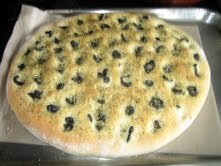 My sister Clare made this olive and herb focaccia which looks like it turned out perfectly. This would go down really well at a picnic or maybe as a side dish with some pasta instead of garlic bread? 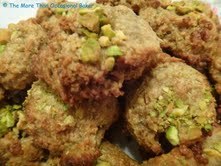 My co-host Ros from The More ThanOccasional Baker was obviously thinking along the same lines as me as she made these fennel and pistachio cookies, creating her own recipe which is probably a lot harder to do than it looks! A new word for my vocabulary is “flamusse” – Mel from Sharky Oven Gloves sent us this flamusse aux pommes, a Burgundian speciality that she says is similar to an apple clafoutis. I love the way the apples are arranged on the top. Florentines were one of the first things I thought of when the random letter generator produced the letter F this month – but I assumed they were quite tricky to make. 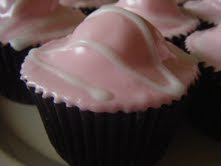 Fiona from Sweet Thing You MakeMy Heart Sing assures me that they are actually pretty simple, and taste really good. I’d tried making fudge once before, and ended up with a sauce for ice cream! I was thinking about making it again for this month’s Alphabakes but wasn’t sure I was brave enough, until I also decided to enter Belleau Kitchen’s Random Recipes, and the recipe that turned up was chocolate fudge shortbread squares! I’ve discovered the trick is to use a thermometer- my fudge set perfectly this time! A rather healthier option now from Alida at My Little Italian Kitchen. These fruit kebabs with chocolate sauce and chopped nuts would be the perfect dessert for a summer barbecue. Finally we have another entry from Fiona of Sweet Thing You Make My Heart Sing, and a snack that I really enjoy - flapjacks. 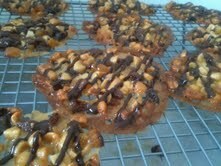 And they're topped with chocolate, which makes them even better! Fiona of Sweet Thing You Make My Heart Sing. Fiona, let us know your address and the book will be on its way to you soon! To find out which letter we are baking with in August, visit The More Than Occasional Baker. Wow, that's a fantastic round-up! I'll put the kettle on and have a really good browse! wow-lots of lovely entries! there are more things beginning with f than I thought.! So many fabulous recipes! 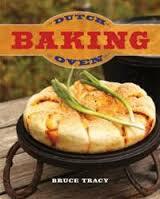 I want to get baking right now!